Nothing has as much of an impact on your comfort as correctly fitted ski boots! 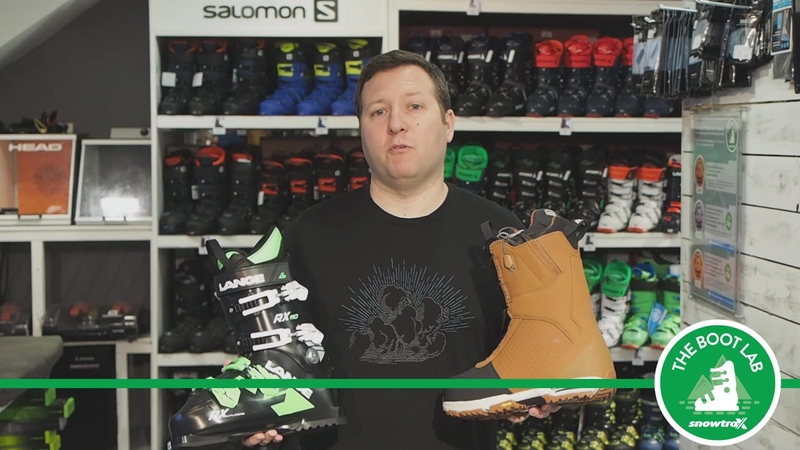 Our boot fitters know exactly how to select, test, customise, and modify ski boots to match your feet perfectly. It all starts with you. When you arrive you'll be asked to fill in a form about your skiing ability, the type of skiing you'd like to do, and any problems you've experience previously with ski boots. Then you'll have your feet individually measured, including the shape of instep and angle of your ankles, both relaxed and under load. Once your boot fitter has all the information about you they'll select a few boot shells to compare against your feet. Different brands have different features in their shape so the boot fitter will select the shell that is closest to your needs. After the shell has been chosen they'll insert the liner and have you put the boot on and flex your legs in various positions to check that the boot isn't interfering with your movement or pinching in any way. This process is repeated in the selected boots until a specific model has been chosen. With the selection done the liners are heat moulded to your feet and and adjustments to the shell are made by either stretching or manipulating the material into it's final shape. According to the earlier measurements your boot fitter will advise you on the kinds of insoles that would best suit your foot. This changes between ski boots and snowboard boots but the principals are the same. The Insole is there to support the arch under loading so that your foot maintains it's ideal shape and doesn't stress the supporting muscles as much. Maintaining the shape of your arch has a huge comfort benefit when it comes to long days on the piste. Our boot fitters are experts and we're so sure that you'll love your boots that we offer a comfort guarantee on all our Boot Lab fittings! • Free refit anytime, for the life of the boot. • Free customisation, stretching, grinding & other modifications, for the life of the boot. • If unused & unmodified, you can return your boots up to 30 days from date of purchase for a free exchange or full refund. • A well fitted technical ski sock & supportive insole must be used with the boot for the guarantee to apply. We strongly recommend these are purchased with the boots for the best comfort & performance. • Proof of purchase is required; please keep your receipt safe. *Rental fee will be approximately 20%-30% of RRP of the boot depending on use.